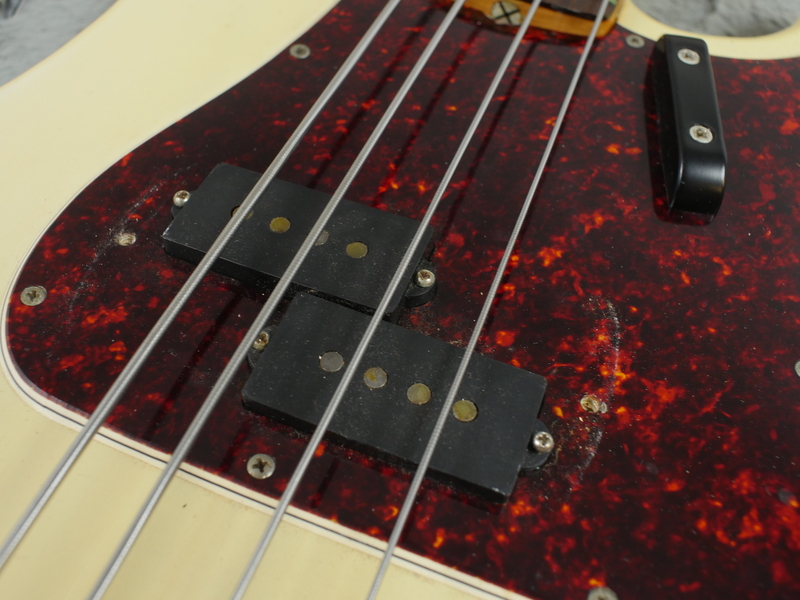 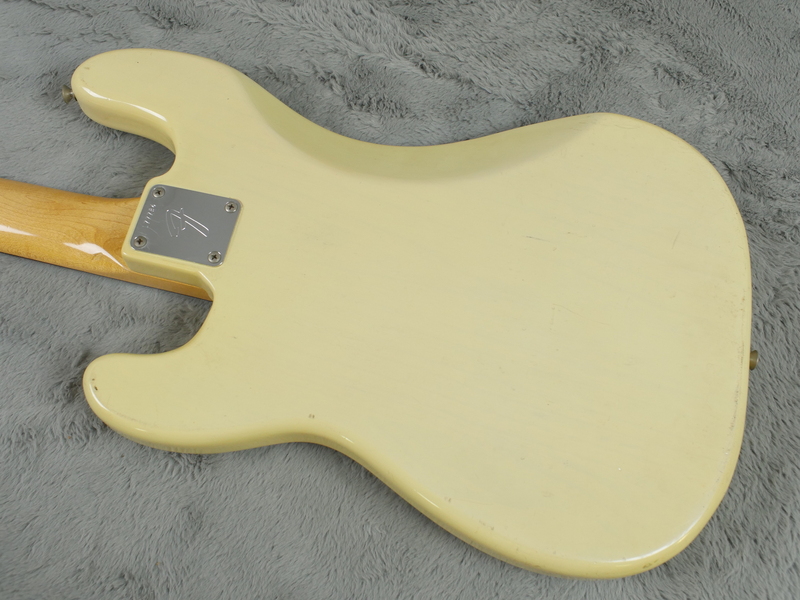 Here’s a rare P Bass in totally excellent plus, almost near mint condition and all correct.. 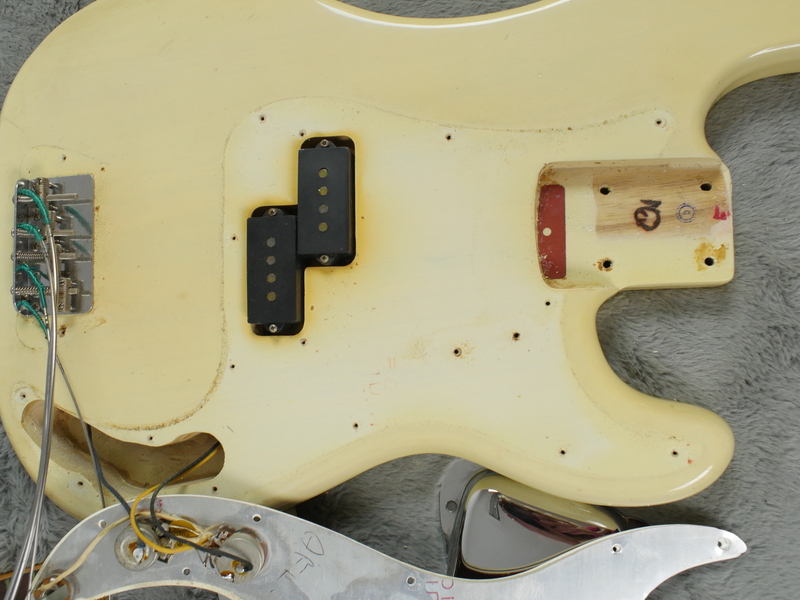 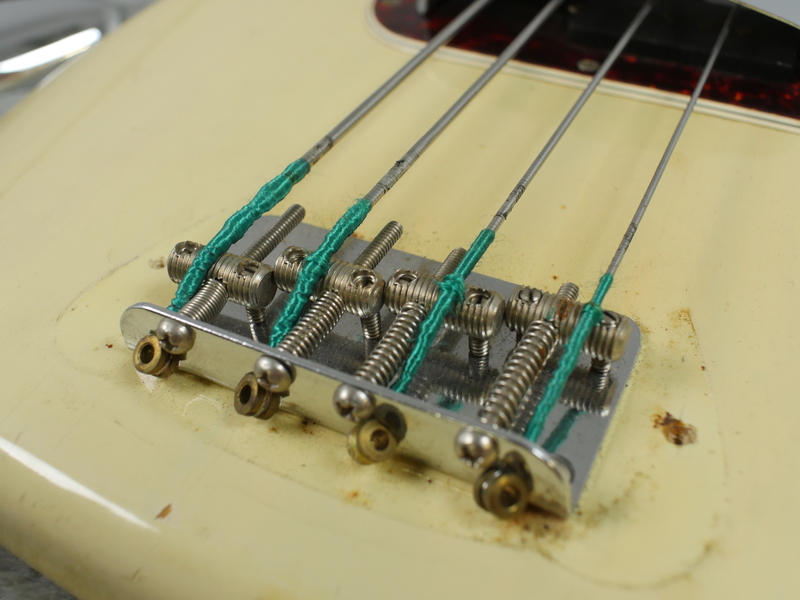 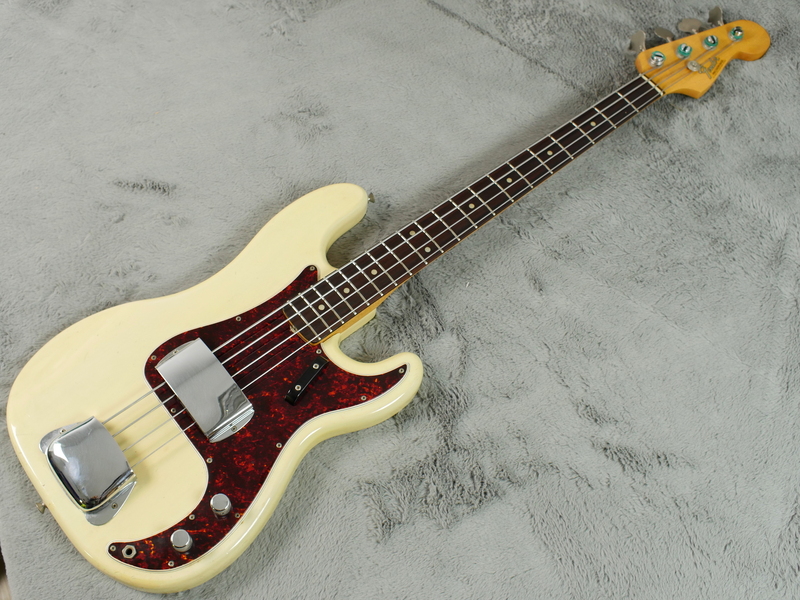 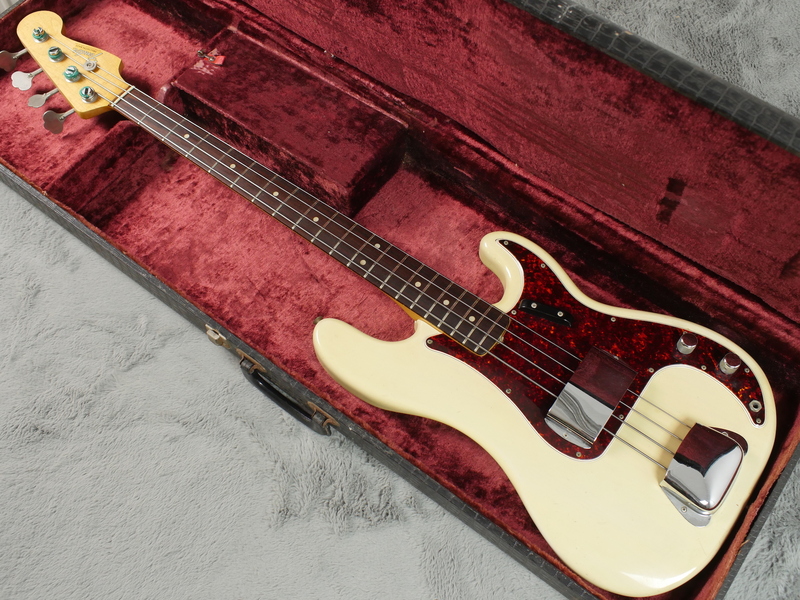 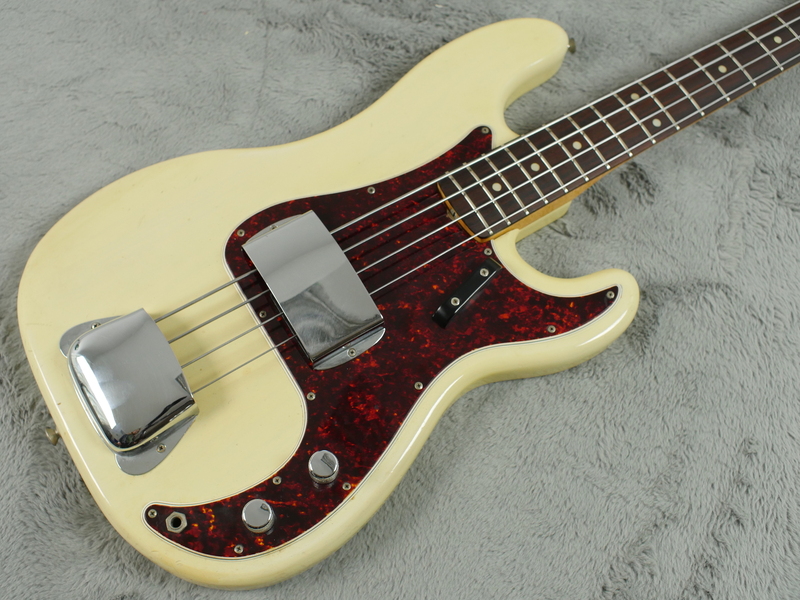 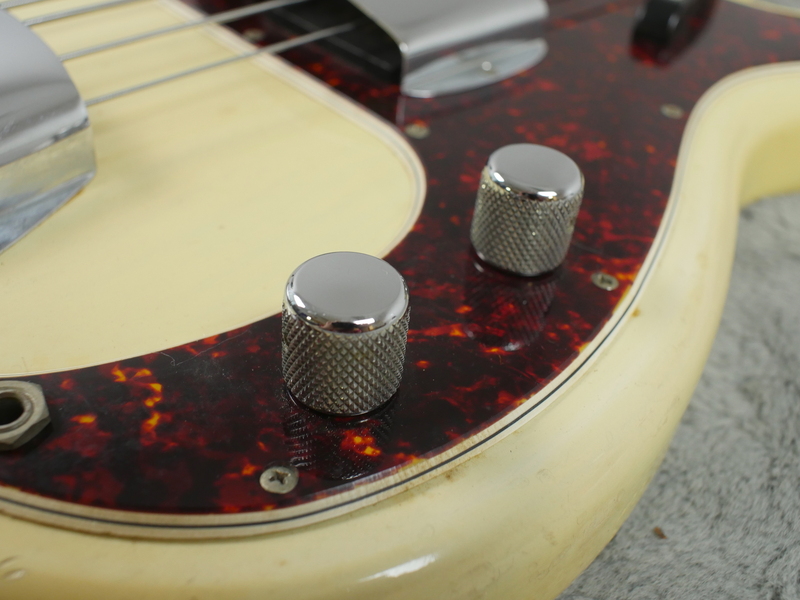 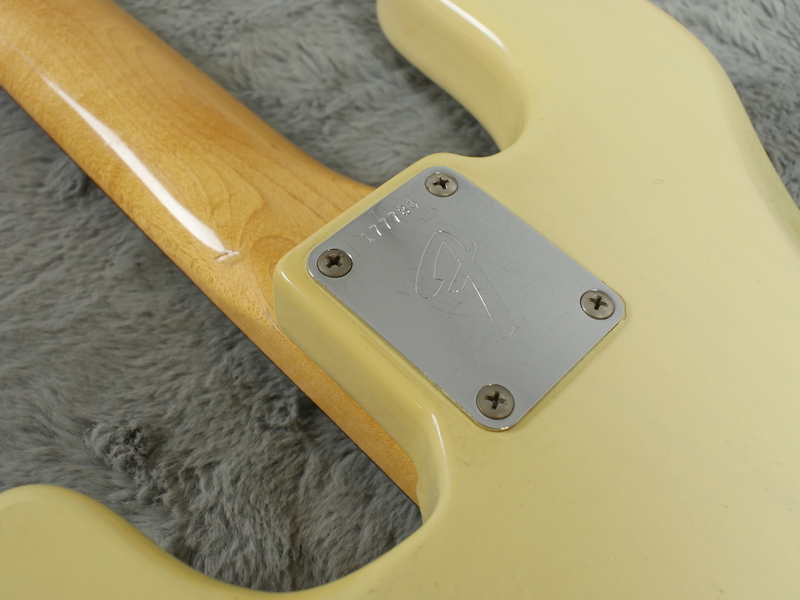 This is a blonde 1966 Fender Precision bass that is real clean and is all correct. 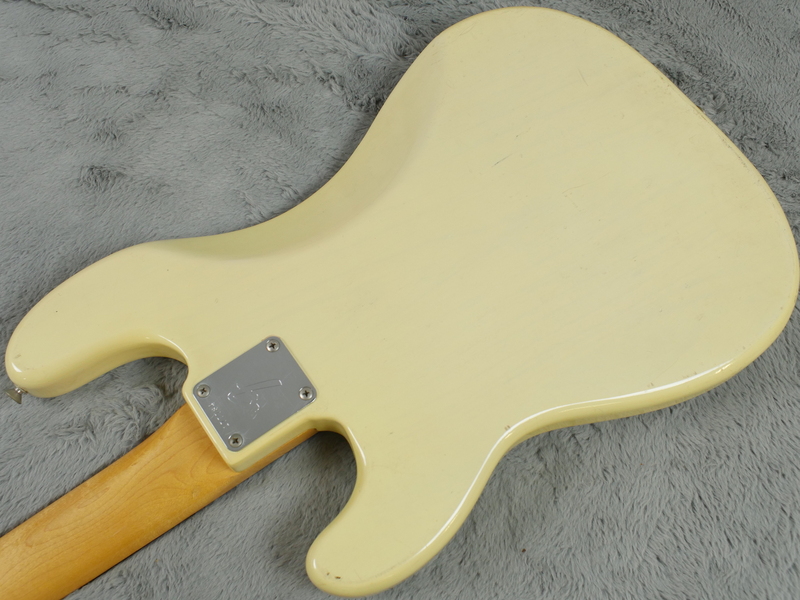 It may even have the original strings on it but we cannot verify this, they are flat wounds and very old, they do ideally need replacing if you are after modern raunchy bass tones but we are going to leave them on there as they are of historic interest and do provide a nice thump and round tone if that is what you seek. 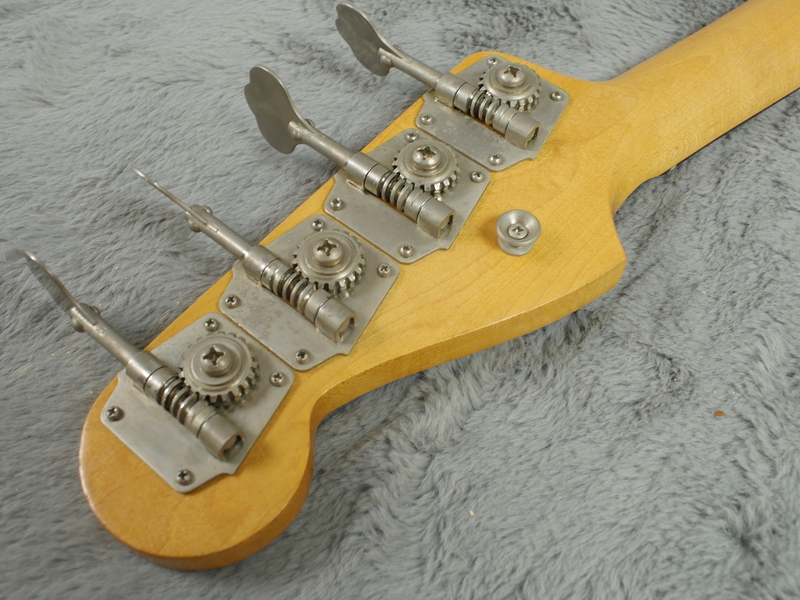 Superb instrument. 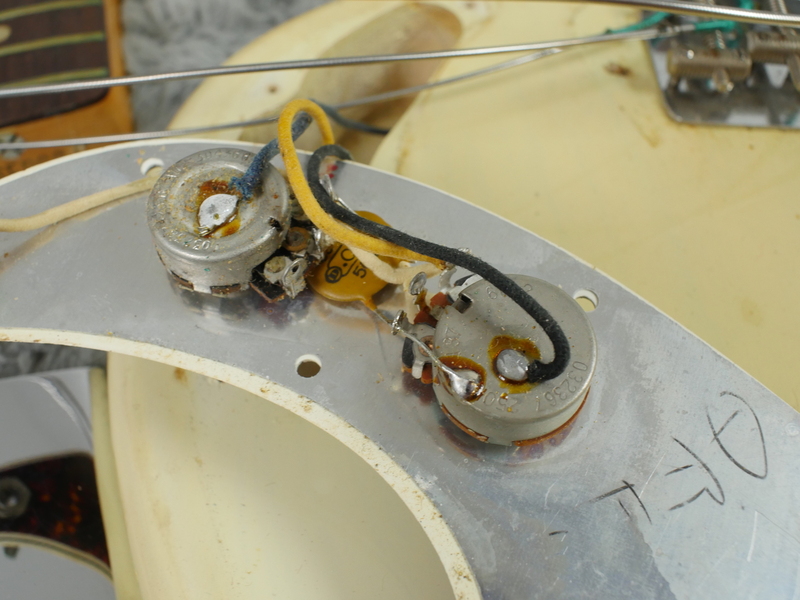 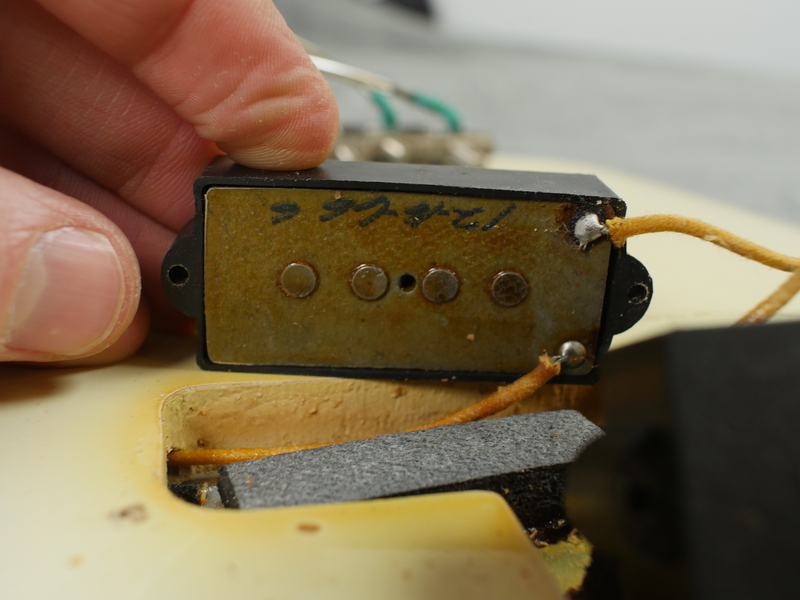 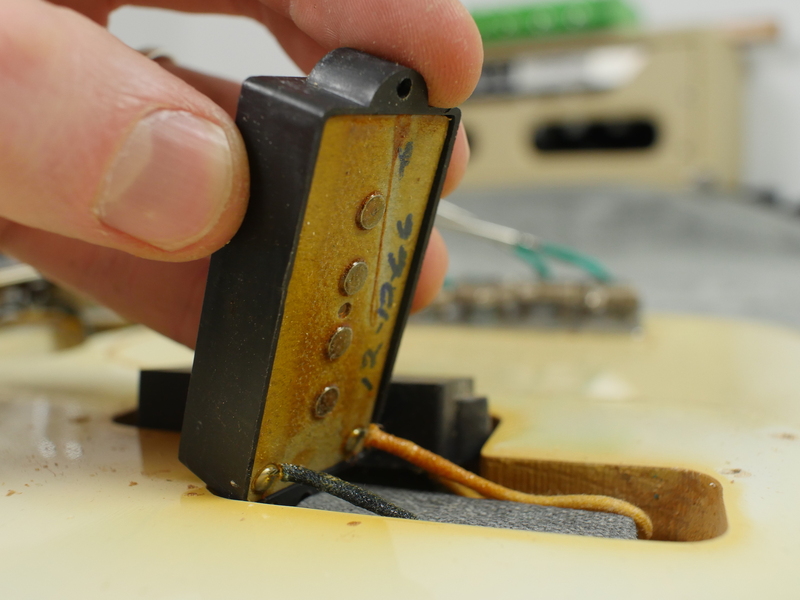 We cannot find a single thing out of place, no solder disturbed and all looks totally clean and undisturbed inside. 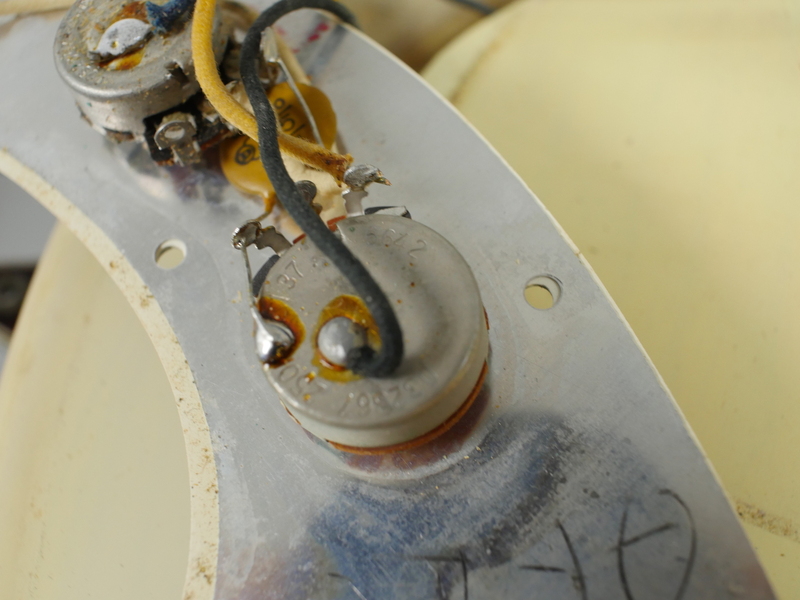 Electrics and hardware are what you expect to be there and everything is totally in place. 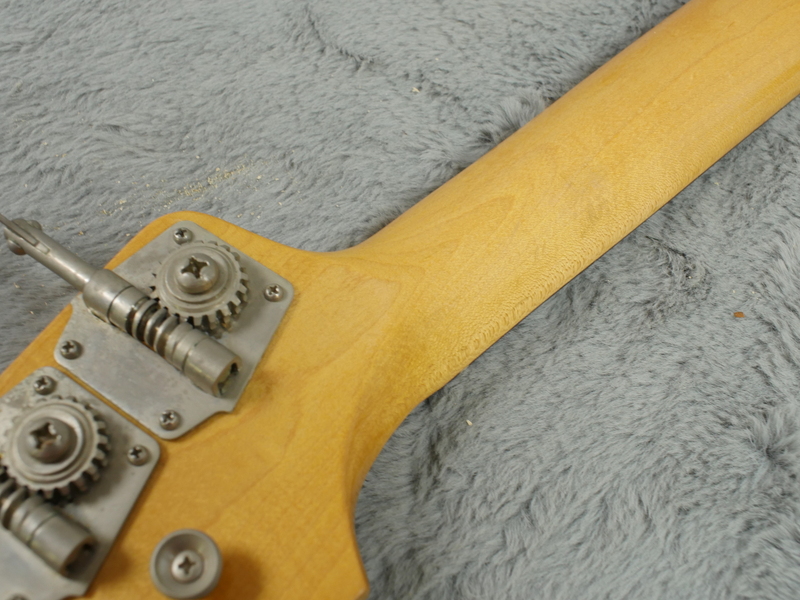 Really nice and rare blonde finish on a very nice ash body. 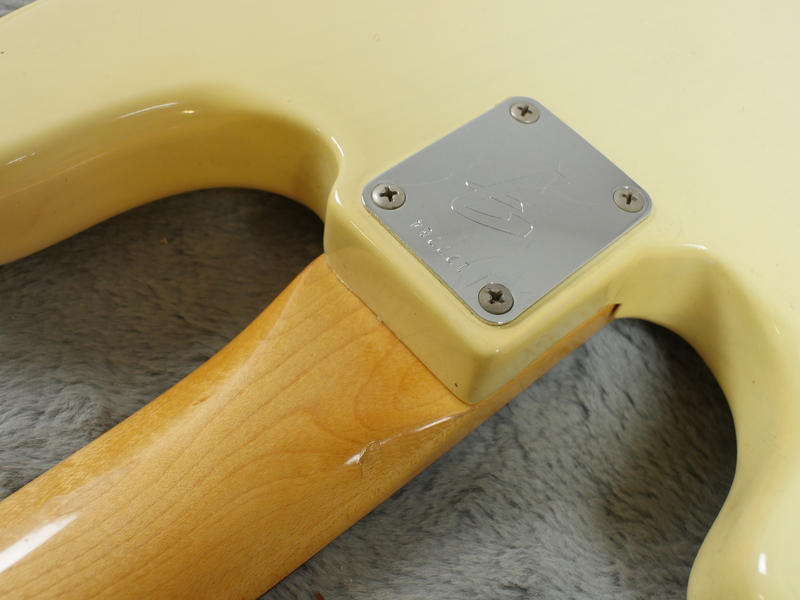 A few minor marks here and there plus some clearcoat buckle worming prevent us from describing this as near MINT but it is very close that category in our book. 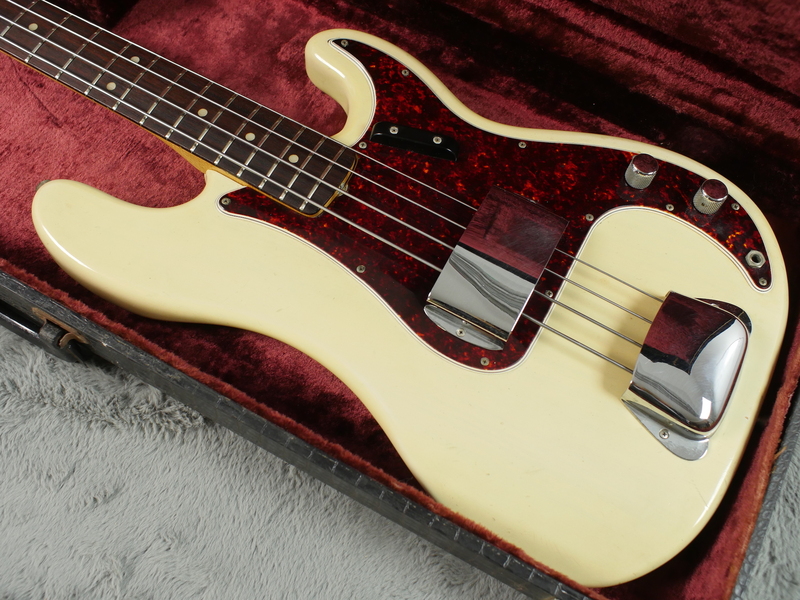 Neck date of September 1966, both pots date mid-late ‘66 and really nice sounding and balanced grey bottom pickups also date to late 1966. 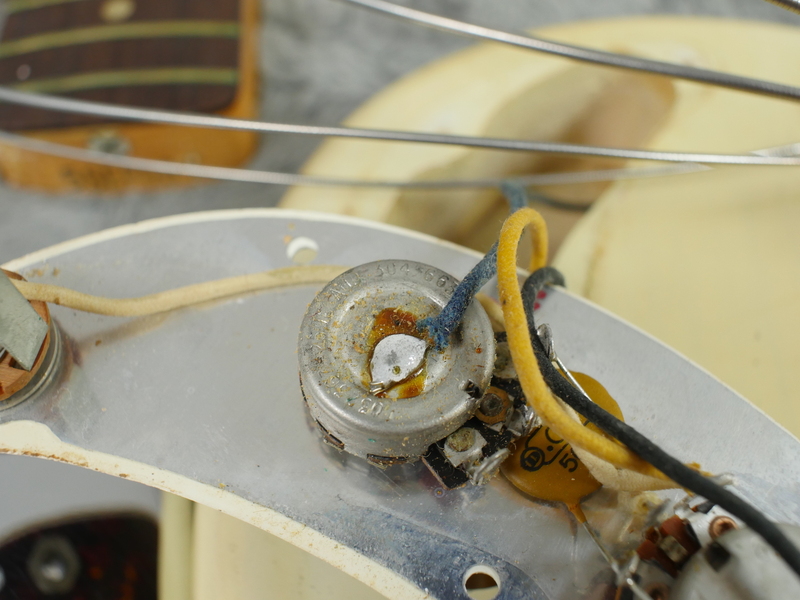 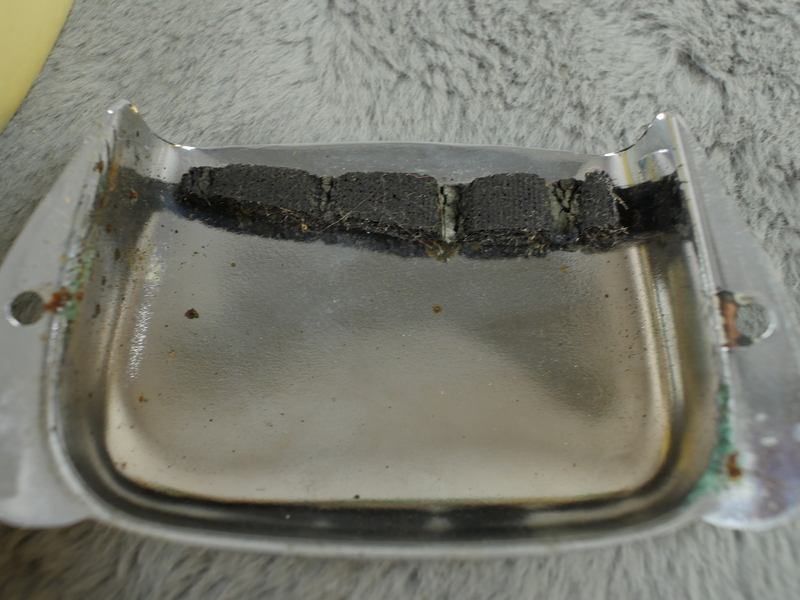 It even has what remains of the original felt damper in the bridge cover (see pics in gallery page). 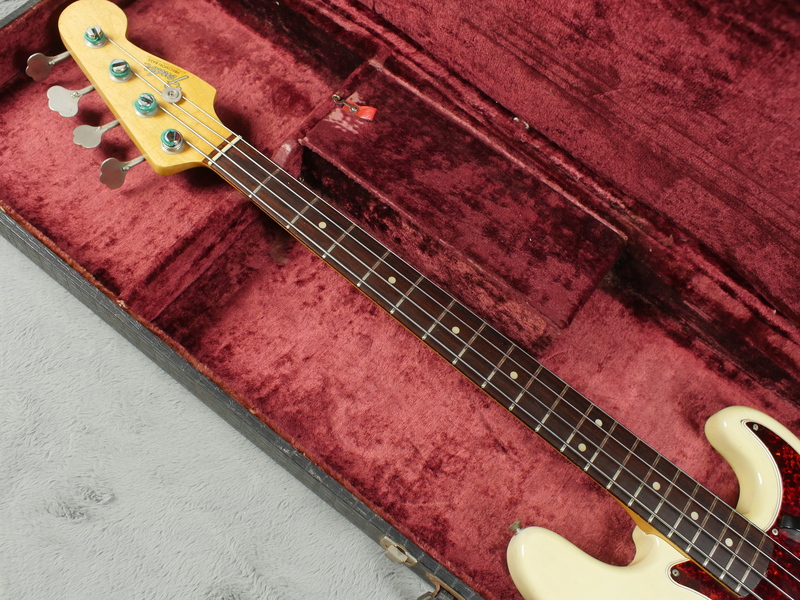 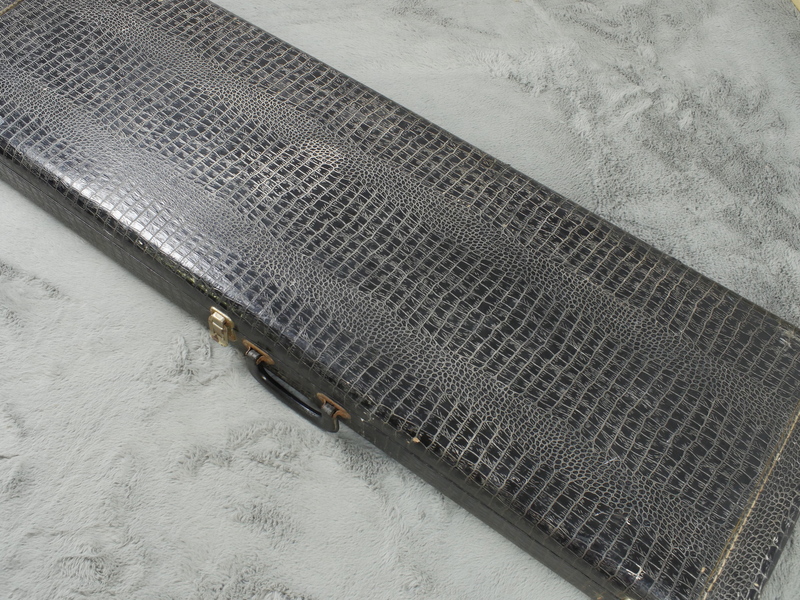 Included is what looks like it could be an original 1966 export case, maybe one sold to Canada. 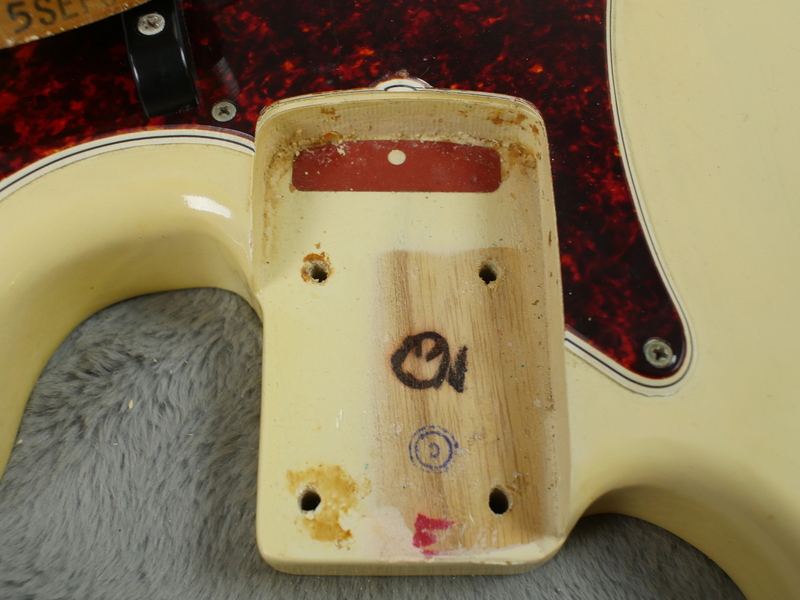 When it arrived here, it was apparent that this superb bass had not been played for some time and a fair bit of oxidisation was on the original frets. 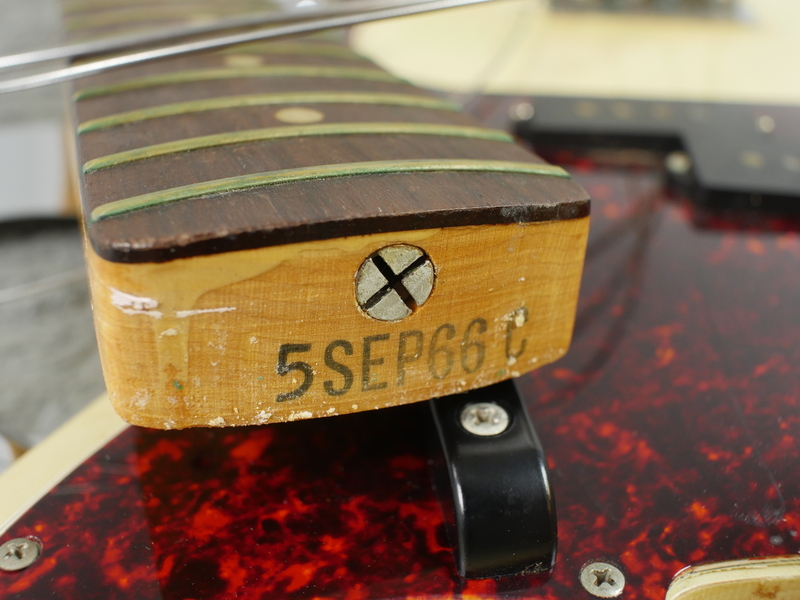 They have had a good polish now and are in perfect condition with zero wear and zero wear on the fingerboard. 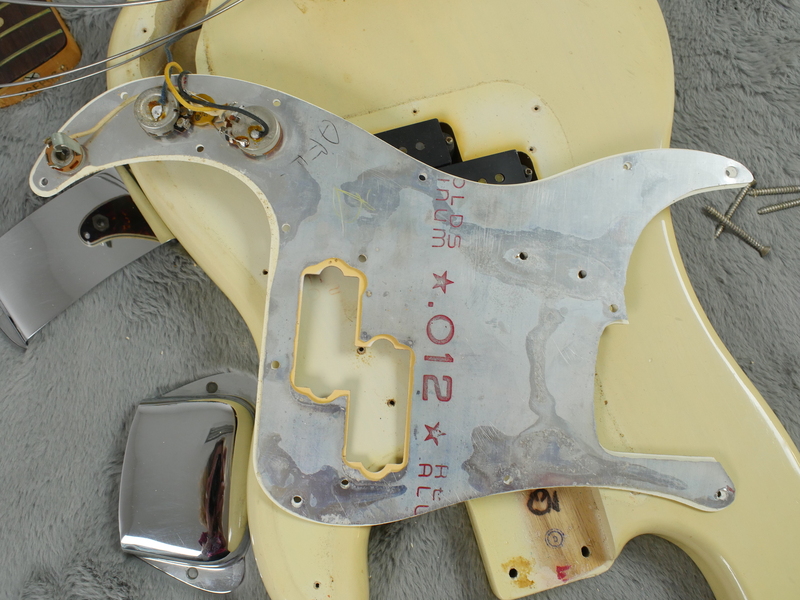 Aided and abetted of course by what appears to be a lifetime of flat wounds.